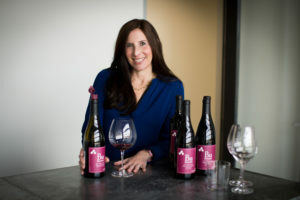 Suzanne Davidson, owner of Oli+Ve, will join us for a fun evening of wine tasting with perfect pairings. Suzanne will be creating “Wine Bites”, incorporating her amazing olive oils & vinegars as well as other gourmet foods from her shop into each bite. We will taste 6 wines including a Sparkling, Rosé, Sauvignon Blanc, Chardonnay, Pinot Noir, Red Blend & Cabernet Sauvignon. The cost is $25 per person. So exciting…one of my favorite winemakers, Kerith Overstreet, is coming to Deep Roots on Wednesday May 8th from 7-9. I met her last year and just fell in love with her. Not only are her wines de-vine, but she is the sweetest person ever! She often sends me personal notes of encouragement, along with fun little gifts like a cheese board made from her old barrel staves and even home-make biscotti. Starting with a single barrel, Kerith has grown Bruliam Wines to about 1000 cases a year. It’s mostly single vineyard Pinot Noir with a smidgen of Rockpile Zinfandel. She added Chardonnay in 2017. Cherishing her grower relationships, Kerith has aligned herself with top vineyards and growers to supply her fruit. Today she cherry picks her fruit from the top vineyards in Sonoma County, Santa Lucia Highlands, and her own Torrey Hill vineyard in the Russian River Valley. The cost to attend is $50 and will include five wines – Rosé, Chardonnay, Pinot Noir (2) and Zinfandel. A five course dinner will be specifically paired for each wine. We are limiting the number of seats to ensure everyone gets one-on-one time with Kerith. Get your tickets soon!